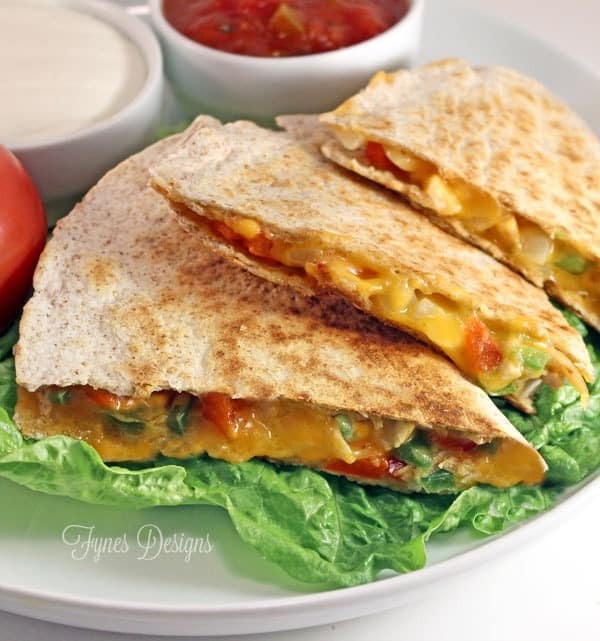 I love quesadillas, they are on the top of my list for quick meal ideas! My secret to making them extra fast is using pre-cooked chicken or turkey pieces. Because this recipe uses lots of other fresh ingredients, one package of meat will do! I can feed my family of 5 (2 adults, 1 teen, 2 smalls) with this recipe! They LOVE how easy these scrumptious cheesy chicken quesadillas are! This chicken quesadillas recipe can easily be adapted to suit any dietary needs. Use light cheese and smaller wraps to make it a weight watcher low point meal or add extra cheese to please party guests! When cutting chicken quesadillas I find a pizza wheel does the best job! Add a big dollop of sour cream and chunky salsa (or something with heat for a bit of excitement) to the side for dipping! A quick and easy meal idea for busy moms, packs a big veggie punch! 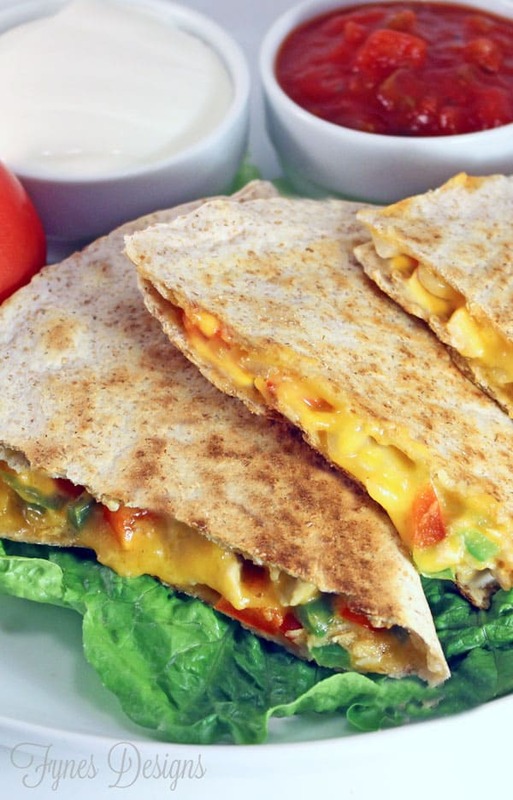 Serve these Easy Cheesy Chicken Quesadillas with a yummy salad. Try this Santa Fe Salad from Suburble it makes a perfect combination! We love all things Mexican and spicy! These look and sound great! A nice option for a weekday when take out is on my mind after a long day at work. Your family is lucky to have such a talented and creative mom, both in the kitchen and the craft room. Awww… thank you for the shout-out, Virginia! These quesadillas look fabulous! They are one of my favourite go-to lunch meals. I’ve never thought of using turkey though, great idea! No prob Tara, I love fiesta food… as I like to call it. They go together like PB&J! Yes please! I love quesadillas! These look particularly yummy!